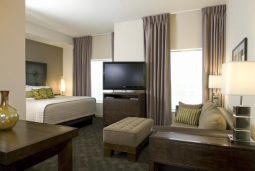 The Hotel Sierra in Shelton provides savvy travelers an energizing alternative to the traditional suite experience. Conveniently located in Fairfield County - the region's corporate address of choice - and on Bridgeport Avenue - or restaurant row as the locals call it - the Hotel Sierra is also located just 20 minutes from Yale University, 2 miles from Pitney Bowes, Unilever, Sikorsky and other Fortune 500 companies. The hotel is also located 18 miles from Tweed-New Haven Airport and 56 miles from LaGuardia. The following cocktail reception option includes meeting space rental, all taxes and gratuities, a professional DJ, Photographer, Class Website, Facebook Reunion Community Page, Classmate Name Badges, On-Site Reunion Coordinator, and much more. Yukon gold and sweet potato, Sausage & peppers, grilled chicken, seared beef tips, Madras curry sauce, champagne cream, mushroom demi-glace, Blue cheese crumbles, shaved Parmesan cheese, cheddar cheese, Maple syrup, candied pecans, Craisins, sour cream, bacon bits, chives, Home made potato chips.